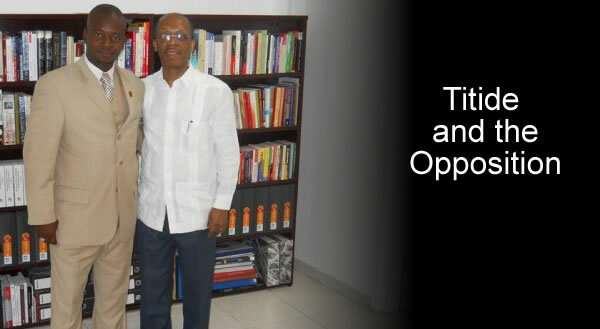 Here is a picture of Former president Jean Bertrand Aristide and Rony Timothe, one of the leaders of MOPOD. Both are in opposition to the Government of Michel Martelly. On September 16, 2014, Rony Timothe MOPOD and several leaders in the opposition are expected to pay a visit to Jean Bertrand Aristide at his residence as a sign of solidarity. Under the order from Judge Lamarre Belizaire, no one is allowed to visit the former president unless they receive explicit approval from the Judge.